There’s no messin’ with this kid when it comes to emulating the blues master himself as Deko has perfected his set in true Gallagher fashion and delivers it with such an exhilarating performance that even Rory Gallagher himself would be proud of. This amazing two hour show comes complete with Deko performing a superb acoustic set which demonstrates the sheer versatility of this phenomenal guitarist and singer. 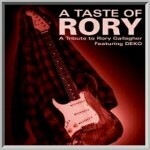 A Taste of Rory have played both the Olympia theatre and Vicars Street in Dublin to rave review-“Deko is the best ‘Rory Gallagher’…………” (Irish Independent), “Excellent band” (Irish times), “Awesome show” (Ted Mc Kenna-Rory’s drummer). Having played every blues festival in Ireland and Europe this tribute to the music of Rory Gallagher is hailed as the number one show of its kind. If you like the blues it’s one gig not to be missed. If you would like to book "Rory Gallagher Tribute-A Taste of Rory" for your venue, corporate event, festival, private party or Christmas show call us now on 086 8883666. For International enquiries contact us on 00 353 86 8883666.